Affinity purified against phospho specific peptide. Include the non-phosphorylated form of the peptide immunogen at 10 μg/ml to the diluted antibody. RAW cells were incubated with or without 2 uM PD184352 and/or 10 uM SB203580 for 1 hour prior to being stimulated for 30 mins with 10 ug/ml anisomycin and then lysed. 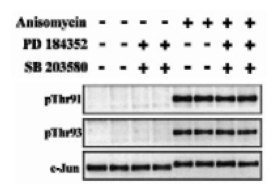 c- Jun was immunoprecipitated from the lysates using anti-c-Jun [S230B] and the immunoprecipitates were subjected to SDS-Page and immunoblotted with anti-c-Jun phospho Thr 91 [S678A], anti-c-Jun phospho Thr 93 and anti-c-Jun [S230B] Binding of the primary antibody was detected using rabbit peroxidase conjugated anti- sheep IgG antibody (1 in 10, 000 dilution, Pierce) followed by enhanced chemiluminescence (ECL, Amersham).